The Mikoyan Skat (Russian: Микоян Скат) is a concept of a stealth unmanned combat aerial vehicle (UCAV) being developed by the Mikoyan for the Russian Ministry of Defence since 2005. A full-size mockup of the Skat UCAV at the MAKS 2007 international air show. Origin of the Skat UCAV dates back to 2005 when Mikoyan started working on the project. 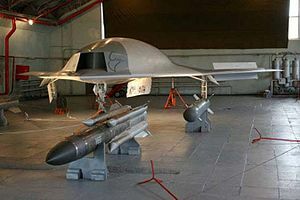 Emphasis was put on low-observability and thus the drone was designed in a flying wing configuration, in a form of a triangle, with use of composite materials and with armament hidden in two internal weapons bays. It's only full-size mockup was presented for the first time at the MAKS 2007 international air show. However, the drone didn't get through a mockup stage and the work on the project was stopped later in 2012 due to lack of funding. The Skat is a low-observable, subsonic UCAV meant to carry weapons in two ventral weapons bays large enough for missiles such as the Kh-31, powered by a single Klimov RD-5000B turbofan engine, a variant of the RD-93. The single-engine subsonic design has an 11.5 meter (37.7 ft) wingspan, and is 10.25 meters (33.6 ft) long. The UCAV has a maximum takeoff weight of ten tons, with a maximum speed of 800 kilometers per hour (497 mph) at low altitude. It is intended to carry a combat load of up to two tons, with a combat radius of 2,000 km (1,240 miles). Possible roles include the suppression and attack of enemy air defenses. The first version of Skat to fly was planned to be piloted in order to meet Russian flight regulations. A number of aerodynamic configurations have been wind tunnel-tested, including with small twin fins. MiG has settled on a tailless configuration. As Chief executive officer of RSK "MiG", Sergei Korotkov said to the press earlier, the development of Skat was discontinued. By the decision of Russian Defence Ministry Sukhoi Holding became the new Head Developer of the Strike UCAV project. Still, Skat experience would be used by Sukhoi. RSK "MiG" specialists are expected to work on the new project. On 3 June 2013, MiG signed a research and development contract to build a UCAV, based on the Skat design. The Sukhoi is using the R&D information from the Skat, in addition to their expertise on the Sukhoi Su-57, to develop their 20-ton Okhotnik-B stealth UCAV. In September 2018, it was reported the MiG has revived the program and that works on the Mikoyan Skat UCAV are currently underway. ^ "Источник: РСК "МиГ" возобновила работы над ударным беспилотником "Скат"". TASS. 11 September 2018. Retrieved 4 February 2019. ^ a b "MiG reportedly resumed work on Skat UCAV". airrecognition.com. 12 September 2018. Retrieved 12 September 2018. ^ "First look at Mig Skat", Aviation Week . ^ Trimble, Steve (January 23, 2019). "New Photo May Reveal Russian Unmanned Strike Aircraft". Aviation Week. Wikimedia Commons has media related to MiG Skat.